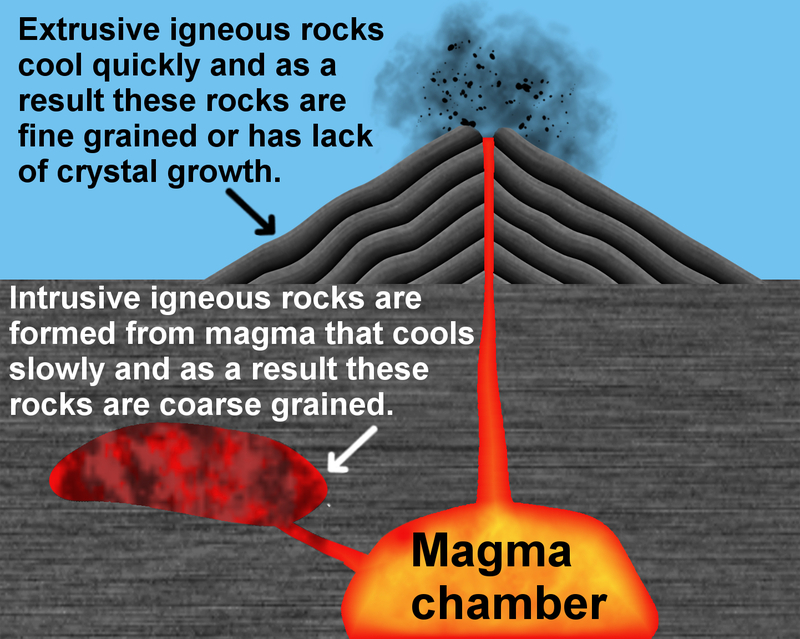 Intrusive or plutonic igneous rocks wherein the magma crystallizes at depth in the Earth. Magma is a mixture of liquid rock, crystals, and gas. Characterized by a wide range of chemical compositions, with high temperature, and properties of a liquid. Magmas are less dense than surrounding rocks, and will therefore move upward. If magma makes it to the surface it will erupt and later crystallize to form an extrusive or volcanic rock. If it crystallizes before it reaches the surface it will form an igneous rock at depth called aplutonic or intrusive igneous rock. Chemical composition of magma is controlled by the abundance of elements in the Earth. Si, Al, Fe, Ca, Mg, K, Na, H, and O make up 99.9%. Since oxygen is so abundant, chemical analyses are usually given in terms of oxides. SiO2 is the most abundant oxide. Felsic or Rhyolitic-- SiO2 65-75%, low in Fe, Mg, Ca, high in K, Na. Gases - At depth in the Earth nearly all magmas contain gas. Gas gives magmas their explosive character, because the gas expands as pressure is reduced. Felsic magmas usually have higher gas contents than mafic magmas. Viscosity is the resistance to flow (opposite of fluidity). Depends on composition, temperature, & gas content. Lower Temperature magmas have higher viscosity than higher temperature magmas. As we have seen the only part of the earth that is liquid is the outer core. But the core is not likely to be the source of magmas because it does not have the right chemical composition. The outer core is mostly Iron, but magmas are silicate liquids. Thus magmas DO NOT COME FROM THE MOLTEN OUTER CORE OF THE EARTH. Thus, since the rest of the earth is solid, in order for magmas to form, some part of the earth must get hot enough to melt the rocks present. We know that temperature increases with depth in the earth along thegeothermal gradient. The earth is hot inside due to heat left over from the original accretion process, due to heat released by sinking of materials to form the core, and due to heat released by the decay of radioactive elements in the earth. Under normal conditions, the geothermal gradient is not high enough to melt rocks, and thus with the exception of the outer core, most of the Earth is solid. Thus, magmas form only under special circumstances. To understand this we must first look at how rocks and mineral melt. As pressure increases in the Earth, the melting temperature changes as well. For pure minerals, there are two general cases. For a pure dry (no H2O or CO2present) mineral, the melting temperate increases with increasing pressure. Melting of rocks containing water or carbon dioxide is similar to melting of wet minerals, melting temperatures initially decrease with increasing pressure, except there is a range of temperature over which there exists a partial melt. Three ways to Generate MagmasFrom the above we can conclude that in order to generate a magma in the solid part of the earth either the geothermal gradient must be raised in some way or the melting temperature of the rocks must be lowered in some way. The geothermal gradient can be raised by upwelling of hot material from below either by uprise solid material (decompression melting) or by intrusion of magma (heat transfer). Lowering the melting temperature can be achieved by adding water or Carbon Dioxide (flux melting). Decompression Melting - Under normal conditions the temperature in the Earth, shown by the geothermal gradient, is lower than the beginning of melting of the mantle. Thus in order for the mantle to melt there has to be a mechanism to raise the geothermal gradient. Once such mechanism is convection, wherein hot mantle material rises to lower pressure or depth, carrying its heat with it. If the raised geothermal gradient becomes higher than the initial melting temperature at any pressure, then a partial melt will form. Liquid from this partial melt can be separated from the remaining crystals because, in general, liquids have a lower density than solids. Basaltic magmas appear to originate in this way. Upwelling mantle appears to occur beneath oceanic ridges, at hot spots, and beneath continental rift valleys. Thus, generation of magma in these three environments is likely caused by decompression melting. Transfer of Heat- When magmas that were generated by some other mechanism intrude into cold crust, they bring with them heat. Upon solidification they lose this heat and transfer it to the surrounding crust. Repeated intrusions can transfer enough heat to increase the local geothermal gradient and cause melting of the surrounding rock to generate new magmas. Transfer of heat by this mechanism may be responsible for generating some magmas in continental rift valleys, hot spots, and subduction related environments. Flux Melting - As we saw above, if water or carbon dioxide are added to rock, the melting temperature is lowered. If the addition of water or carbon dioxide takes place deep in the earth where the temperature is already high, the lowering of melting temperature could cause the rock to partially melt to generate magma. 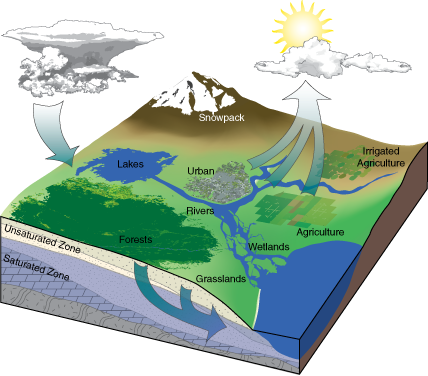 One place where water could be introduced is at subduction zones. Here, water present in the pore spaces of the subducting sea floor or water present in minerals like hornblende, biotite, or clay minerals would be released by the rising temperature and then move in to the overlying mantle. Introduction of this water in the mantle would then lower the melting temperature of the mantle to generate partial melts, which could then separate from the solid mantle and rise toward the surface. The chemical composition of magma can vary depending on the rock that initially melts (the source rock), and process that occur during partial melting and transport. 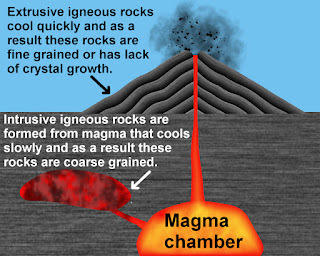 The initial composition of the magma is dictated by the composition of the source rock and the degree of partial melting. In general, melting of a mantle source (garnet peridotite) results in mafic/basaltic magmas. Melting of crustal sources yields more siliceous magmas. In general more siliceous magmas form by low degrees of partial melting. As the degree of partial melting increases, less siliceous compositions can be generated. So, melting a mafic source thus yields a felsic or intermediate magma. Melting of ultramafic (peridotite source) yields a basaltic magma. But, processes that operate during transportation toward the surface or during storage in the crust can alter the chemical composition of the magma. These processes are referred to asmagmatic differentiation and include assimilation, mixing, and fractional crystallization. Assimilation - As magma passes through cooler rock on its way to the surface it may partially melt the surrounding rock and incorporate this melt into the magma. Because small amounts of partial melting result in siliceous liquid compositions, addition of this melt to the magma will make it more siliceous. Mixing - If two magmas with different compositions happen to come in contact with one another, they could mix together. The mixed magma will have a composition somewhere between that of the original two magma compositions. Evidence for mixing is often preserved in the resulting rocks. Fractional Crystallization - When magma crystallizes it does so over a range of temperature. Each mineral begins to crystallize at a different temperature, and if these minerals are somehow removed from the liquid, the liquid composition will change. The processes is called magmatic differentiation by Fractional Crystallization. Because mafic minerals like olivine and pyroxene crystallize first, the process results in removing Mg, Fe, and Ca, and enriching the liquid in silica. Thus crystal fractionation can change a mafic magma into a felsic magma. Crystals can be removed by a variety of processes. If the crystals are more dense than the liquid, they may sink. If they are less dense than the liquid they will float. If liquid is squeezed out by pressure, then crystals will be left behind. Removal of crystals can thus change the composition of the liquid portion of the magma. Let me illustrate this using a very simple case. Imagine a liquid containing 5 molecules of MgO and 5 molecules of SiO2. Initially the composition of this magma is expressed as 50% SiO2 and 50% MgO. i.e. Now let's imagine I remove 1 MgO molecule by putting it into a crystal and removing the crystal from the magma. Now what are the percentages of each molecule in the liquid? Thus, composition of liquid can be changed. The type of rock body. The intrusive or plutonic environment is below the surface of the earth. This environment is characterized by higher temperatures which result in slow cooling of the magma. Intrusive or plutonic igneous rocks form here. Where magma erupts on the surface of the earth, temperatures are lower and cooling of the magma takes place much more rapidly. This is the extrusive or volcanic environment and results in extrusive or volcanic igneous rocks. When magmas reach the surface of the Earth they erupt from a vent called a volcano. They may erupt explosively or non-explosively. Non-explosive eruptions are favored by low gas content and low viscosity magmas (basaltic to andesitic magmas and sometimes rhyolitic magma). Explosive eruptions are favored by high gas content and high viscosity (andesitic to rhyolitic magmas). High pressure in gas bubbles causes the bubbles to burst when reaching the low pressure at the Earth's surface. Bursting of bubbles fragments the magma into pyroclasts and tephra (ash). Cloud of gas and tephra rises above volcano to produce an eruption column that can rise up to 45 km into the atmosphere. Tephra that falls from the eruption column produces a tephra fall deposit. If eruption column collapses a pyroclastic flow may occur, wherein gas and tephra rush down the flanks of the volcano at high speed. This is the most dangerous type of volcanic eruption. The deposits that are produced are called ignimbrites. Magma that cools at depth form bodies of rocks called intrusive bodies or plutonic bodies called plutons, from Greek god of the underworld - Pluto. When magma intrudes it usually affects the surrounding rock and is also affected by the surrounding rock. It may metamorphose the surrounding rocks or cause hydrothermal alteration. The magma itself may also cool rapidly near the contact with the surrounding rock and thus show a chilled margin next to the contact. It may also incorporate pieces of the surrounding rocks without melting them. These incorporated pieces are called xenoliths (foreign rocks). Magma intrudes by injection into fractures in the rock and expanding the fractures. The may also move by a process called stoping, wherein bocks are loosened by magma at the top of the magma body with these blocks then sinking through the magma to accumulate on the floor of the magma body. In relatively shallow environments intrusions are usually tabular bodies like dikes and sills or domed roof bodies called laccoliths. Dikes are small (<20 m wide) shallow intrusions that show a discordant relationship to the rocks in which they intrude. Discordant means that they cut across preexisting structures. They may occur as isolated bodies or may occur as swarms of dikes emanating from a large intrusive body at depth. Sills are also small (<50 m thick) shallow intrusions that show a concordant relationship with the rocks that they intrude. Sills usually are fed by dikes, but these may not be exposed in the field. Laccoliths are somewhat large intrusions that result in uplift and folding of the preexisting rocks above the intrusion. They are also concordant types of intrusions. Deeper in the earth intrusion of magma can form bulbous bodies called plutons and the coalescence of many plutons can form much larger bodies called batholiths. Plutons are large intrusive bodies, of any shape that intrude in replace rocks in an irregular fashion. Stocks are smaller bodies that are likely fed from deeper level batholiths. Stocks may have been feeders for volcanic eruptions, but because large amounts of erosion are required to expose a stock or batholith, the associated volcanic rocks are rarely exposed. If multiple intrusive events occur in the same part of the crust, the body that forms is called abatholith. Several large batholiths occur in the western U.S. - The Sierra Nevada Batholith, the Coast Range Batholith, and the Idaho Batholith, for example (See figure 6.10d in your text). 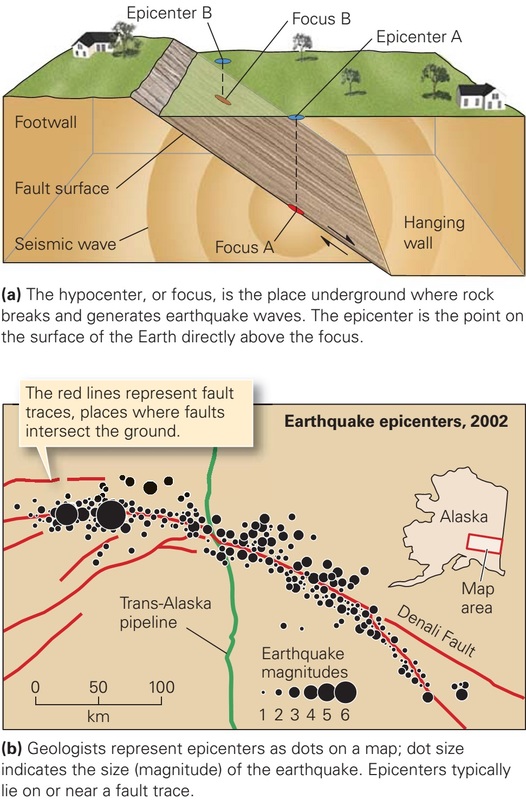 During a magmatic event there is usually a close relationship between intrusive activity and extrusive activity, but one cannot directly observe the intrusive activity. Only after erosion of the extrusive rocks and other rock above the intrusions has exposed the intrusions do they become visible at the earth's surface (see figure 6.10a in your text). The rate of cooling of magma depends largely on the environment in which the magma cools. Rapid cooling takes place on the Earth's surface where there is a large temperature contrast between the atmosphere/ground surface and the magma. Cooling time for material erupted into air and water can be as short as several seconds. For lava flows cooling times are on the order of days to weeks. Shallow intrusions cool in months to years and large deep intrusions may take millions of years to cool. Because cooling of the magma takes place at a different rate, the crystals that form and their interrelationship (texture) exhibit different properties. Fast cooling on the surface results in many small crystals or quenching to a glass. Gives rise to aphanitic texture (crystals cannot be distinguished with the naked eye), or obsidian (volcanic glass). Slow cooling at depth in the earth results in fewer much larger crystals, gives rise to phaneritic texture. Porphyritic texture develops when slow cooling is followed by rapid cooling. Phenocrysts = larger crystals, matrix orgroundmass = smaller crystals. Igneous rocks are classified on the basis of texture and chemical composition, usually as reflected in the minerals that from due to crystallization. 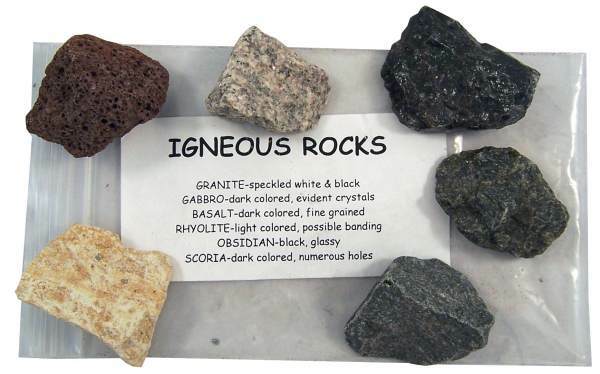 You will explore the classification of igneous rocks in the laboratory portion of this course. Basalts, Andesites, and Rhyolites are all types of volcanic rock distinguished on the basis of their mineral assemblage and chemical compostion (see figure 6.13 in your text). These rocks tend to be fine grained to glassy or porphyritic. Depending on conditions present during eruption and cooling, any of these rock types may form one of the following types of volcanic rocks. Obsidian - dark colored volcanic glass showing concoidal fracture and few to no crystals. Usually rhyolitic . Pumice - light colored and light weight rock consisting of mostly holes (vesicles) that were once occupied by gas, Usually rhyolitic or andesitic. Vesicular rock - rock filled with holes (like Swiss cheese) or vesicles that were once occupied by gas. Usually basaltic and andesitic. 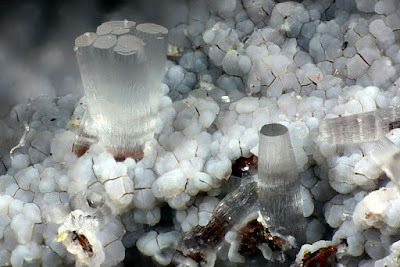 If vesicles in a vesicular basalt are later filled by precipitation of calcite or quartz, the fillings are termed amygdules and the basalt is termed an amygdularl basalt. Pyroclasts = hot, broken fragments. Result from explosively ripping apart of magma. Loose assemblages of pyroclasts called tephra. Depending on size, tephra can be classified as bombs. lapilli, or ash. Rock formed by accumulation and cementation of tephra called a pyroclastic rock or tuff. Welding, compactioncause tephra (loose material) to be converted in pyroclastic rock. 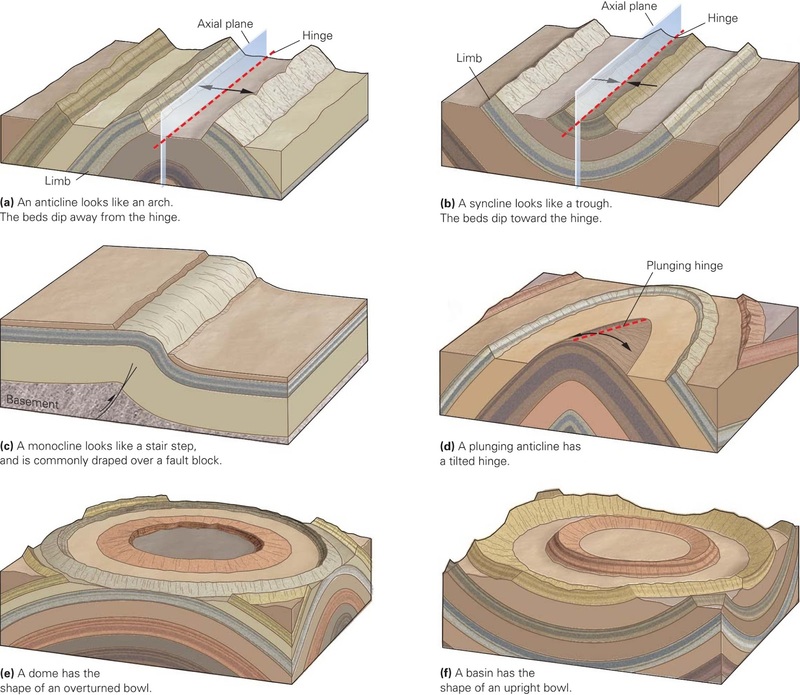 Shallow intrusions like dikes and sills are usually fine grained and sometimes porphritic because cooling rates are similar to those of extrusive rocks. Classification is similar to the classification for volcanic/extrusive rocks. Coarse grained rocks, formed at deeper levels in the earth include gabbros, diorites, and granites. 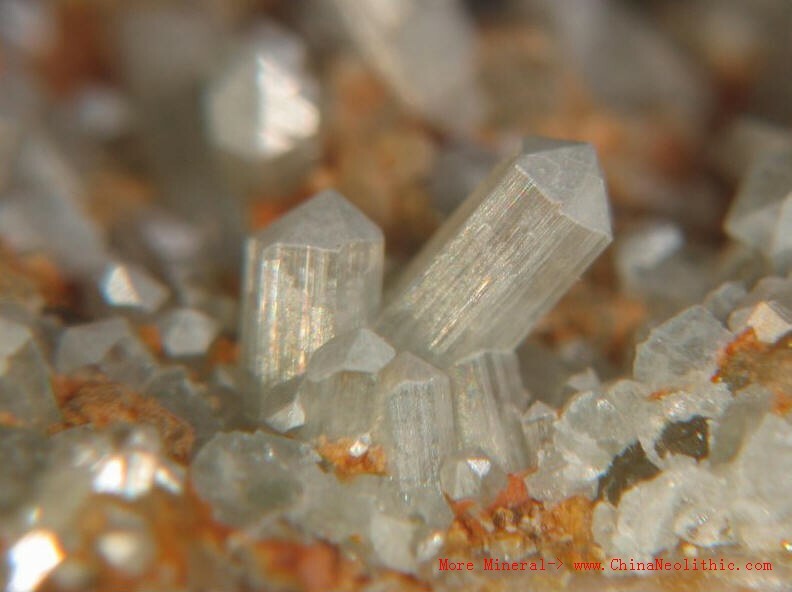 Note that these are chemically equivalent to basalts, andesites, and rhyolites, but may have different minerals or different proportions of mineral because their crystallization history is not interrupted as it might be for extrusive rocks (see figure 6.13 in your text). Pegmatites are very coarse grained igneous rocks consisting mostly of quartz and feldspar as well as some more exotic minerals like tourmaline, lepidolite, muscovite. These usually form dikes related to granitic plutons. Igneous activity is currently taking place as it has in the past in various tectonic settings. These include diverging and converging plate boundaries, hot spots, and rift valleys. At oceanic ridges, igneous activity involves eruption of basaltic lava flows that form pillow lavas at the oceanic ridges and intrusion of dikes and plutons beneath the ridges. The lava flows and dikes are basaltic and the plutons mainly gabbros. These processes form the bulk of the oceanic crust as a result of sea floor spreading. Magmas are generated by decompression melting as hot solid asthenosphere rises and partially melts. As discussed previously, hot spots are places are places where hot mantle ascends toward the surface as plumes of hot rock. Decompression melting in these rising plumes results in the production of magmas which erupt to form a volcano on the surface or sea floor, eventually building a volcanic island. As the overriding plate moves over the hot spot, the volcano moves off of the hot spot and a new volcano forms over the hot spot. This produces a hot spot track consisting of lines of extinct volcanoes leading to the active volcano at the hot spot. A hot spot located beneath a continent can result in heat transfer melting of the continental crust to produce large rhyolitic volcanic centers and plutonic granitic plutons below. A good example of a continental hot spot is at Yellowstone in the western U.S. Occasionally a hot spot is coincident with an oceanic ridge. In such a case, the hot spot produces larger volumes of magma than normally occur at ridge and thus build a volcanic island on the ridge. Such is the case for Iceland which sits atop the Mid-Atlantic Ridge. Rising mantle beneath a continent can result in extensional fractures in the continental crust to form a rift valley. As the mantle rises it undergoes partial melting by decompression, resulting in the production of basaltic magmas which may erupt as flood basalts on the surface. Melts that get trapped in the crust can release heat resulting in melting of the crust to form rhyolitic magmas that can also erupt at the surface in the rift valley. An excellent example of a continental rift valley is the East African Rift. In the past, large volumes of mostly basaltic magma have erupted on the sea floor to form large volcanic plateaus, such as the Ontong Java Plateau in the eastern Pacific. Such large volume eruptions can have affects on the oceans because they change the shape of ocean floor and cause a rise in sea level, that sometimes floods the continents. The plateaus form obstructions which can drastically change ocean currents. These changes in the ocean along with massive amounts of gas released by the magmas can alter climate and have drastic effects on life on the planet. Crystallization of Magma and Lava produced from the melting of mantle usually produced basaltic magmas, compositions that are referred to as mafic because of their high proportions of Mg and Fe. Mantle rocks themselves are called ultramafic. On the off chance that you ever asked why quartz (SiO2) is so regular in crustal rocks or why there are such a large number of distinctive silicate minerals, these information ought to answer your inquiries. The all the more a specific component that you need to work with, the more that component will shape minerals. The equal number of particles is especially valuable for assessing mineral creation as it permits you to anticipate mineral equations and henceforth mineral rates. Anyway, the matter's significance is that the outside layer contains a considerable measure of Si and O and there is a great deal of SiO44- accessible for minerals. Presently what we have to will be to examine how these minerals really develop in liquid rock. As the magma begins to cools, it will begin to develop gems. This procedure is called crystallization also, it is similar to precipitation of gems from arrangements. Keep in mind when you needed to develop salt precious stones in secondary school science class? You took salt, broke up it in a glass of warm water and put a string in the glass to go about as a site of starting gem development or nucleation. The more drawn out that you cleared out the string in the arrangement, the greater the gems got to be. In the event that you were eager like me, you hauled the string out following a couple of minutes which was obviously, too early for any gems to have framed. On the off chance that you allowed the string to sit unbothered for a day or somewhere in the vicinity, precious stones too little to be seen with the stripped eye would have framed. After some time, layer after layer of salt is added to the seed gems making greater and greater precious stones. Following a couple of weeks, you could see the cubic propensity of halite. Crystallization of magma works the same way. Seed precious stones frame first and the gems simply get greater and greater and greater. Be that as it may, there are a few noteworthy contrasts between crystallization of magma and precipitation of salt precious stones. Not the minimum of which is that magma contains a blend of components and in this manner will shape a wide range of minerals as it takes shape. Salt water is unadulterated and just structures halite as an accelerate. Above 1800 degrees C, there are basically no strong parts to the melt. Everything is fluid. As the magma cools, seed precious stones of olivine start to structure. 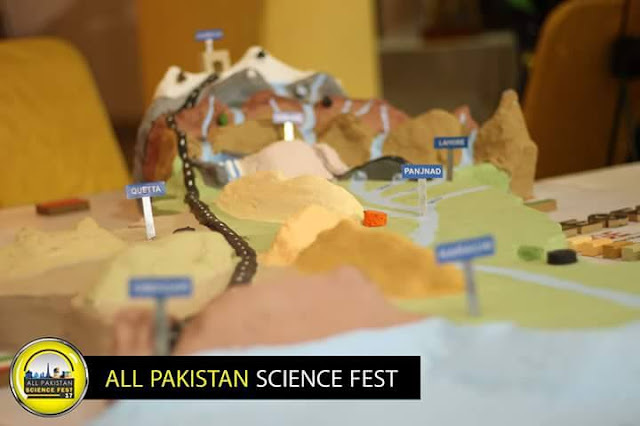 The concoction piece of olivine, at any rate as per your book, is (Mg,Fe)2SiO4. That olivine contains SiO4 ought to shock no one to you. The cations are Mg and Fe. Any mineral that contains these two components is called ferromagnesium. Ferromagnesium minerals have a tendency to be the main to frame from cooling magmas. As crystallization proceeds with, the olivine precious stones get bigger and extensive as layer upon layer is included to the seed precious stones. The final result is a mineralogical form of the "Gob-plug" confections that you used to pop in your mouths. You know the ones; they were multi-layered. The more you sucked them the outsider the hues got to be. You frequently see slight geochemical changes in the olivine gems as they develop. They much of the time begin off Mg rich, yet turn out to be more Fe rich after some time. This is called zonation. It is essential at this opportunity to advise you that olivine is very a solitary mineral. We simply regard it as one, yet olivine is really a mineral gathering. There are two end individuals, 1) Fayalite (Mg2SiO4) and 2) Forsterite (Fe2SiO4).As time goes on and the temperature starts to drop an increasing amount, different minerals start to take shape out of the magma. At around 1100 degrees C, another ferromagnesium mineral structures. Pyroxene (compound organization: Fe,Mg(SiO3)2) takes shape alongside olivine. This is an imperative idea. Crystallization of particular minerals is not successive; they cover one another. Every now and then 3 or 4 or more minerals are all taking shape in the meantime. When minerals start to shape in a melt, they begin to settle descending because of the impact of gravity. Minerals as strong substances tend to have higher particular gravities than the magma that they are taking shape from. Thus they sink descending. The procedure is called gravitational settling. The olivine-rich rock is called Dunite. The pyroxene-olivine-rich rock is called peridotite. As the magma keeps on cooling, diverse minerals begin to shape. The grouping that they take shape out in is known as the Bowen's Response Series. We'll get to that in a moment. In any case, initial, a remark about what happens to the magma as precious stones structure. The initial two minerals to shape from a cooling magma are olivine and pyroxene. Both of these minerals contain Mg, Fe, Si and O. As we examined before, the Earth's outside is basically formed of just 8 components. Four of them join to frame olivine and pyroxene. As olivine and pyroxene take shape, the relative rate of Mg and Fe drop in the remaining magma on the grounds that they are being uprooted by the minerals as they settle out of the melt. All the while, the relative convergences of Ca, Na, K and Al in the magma increment as olivine and pyroxene structure. This continuous change in magma piece is called fractionation or partial crystallization and it is to a great extent in charge of the mineral grouping containing the Bowen's response arrangement. World's most deadly minerals that are valuable make the present day world go 'round. They're utilized as a part of everything from circuit sheets to tableware. They're likewise the absolute most poisonous materials known not, and unearthing them has demonstrated so perilous throughout the years, some have been eliminated of mechanical generation inside and out. Recorded beneath are the 10 most savage minerals on earth. These stones don't should be tossed to hurt you. 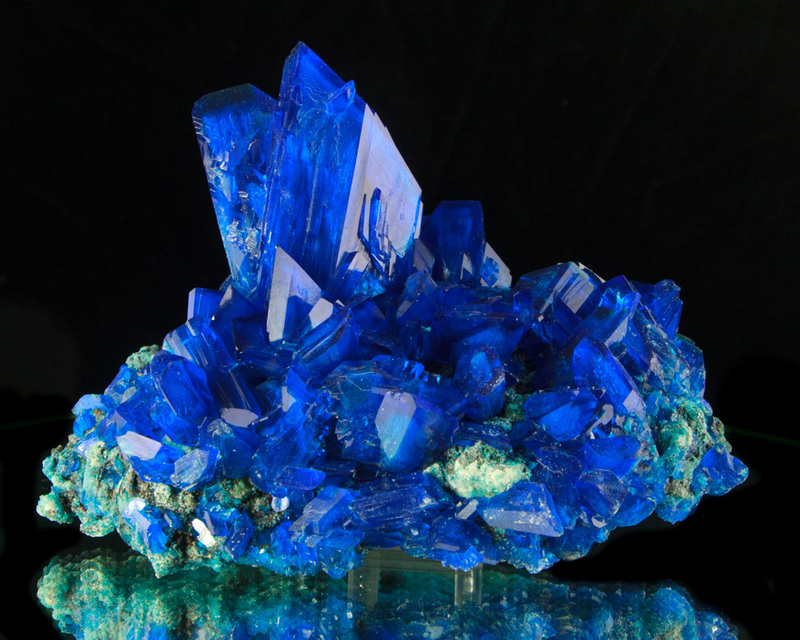 Chalcanthite (hydrated copper sulphate) is the brilliant blue mineral developed from arrangement in science labs and home substance packs. Chalcanthite ought to never be taste tried by beginner researchers for salt substance, or a to a great degree genuine overdose of copper could come about. Simply discharging gems of the blue mineral has murdered whole lakes of green growth, and postured extraordinary ecological dangers. . It is water solvent and will take shape out again from arrangement. The copper in this mineral is exceptionally bio-accessible and is lethal to plants and in high amounts dangerous to people. Hutchinsonite is a sulfosalt mineral of thallium, arsenic and lead with recipe (Tl,Pb)2As5S9. Hutchinsonite is an unsafe however emotional blend of thallium, lead and arsenic. Is an uncommon sulphosalt mineral that obliges taking care of with extraordinary consideration as every one of the three of its fundamental segments are toxic especially thallium as it can bring about male pattern baldness, genuine ailment and passing. The three toxic metals shape a deadly mineral mixed drink that ought to be taken care of just with incredible alert. 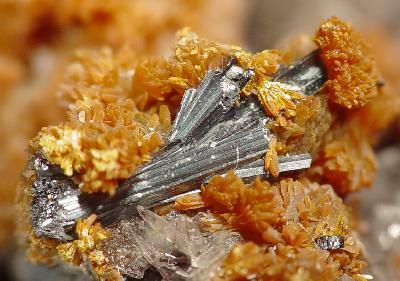 Galena is a stand out amongst the most bounteous and generally appropriated sulphide minerals. Galena is the standard metal of lead, and structures sparkling silver 3D squares with unnaturally flawless shapes. 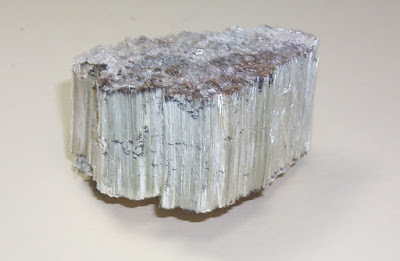 In spite of the fact that lead is ordinarily greatly adaptable, the sulphur substance of galena makes it phenomenally weak and receptive to compound treatment. It's not as awful as mercury, which will execute you promptly through and through, however lead doesn't get flushed out of your framework. It aggregates throughout the years, in the long run coming to harmful levels. When that happens both you and your children pay the cost, as lead danger is cancer-causing to you and is teratogenic (creating extreme conception deformities) to you're posterity. 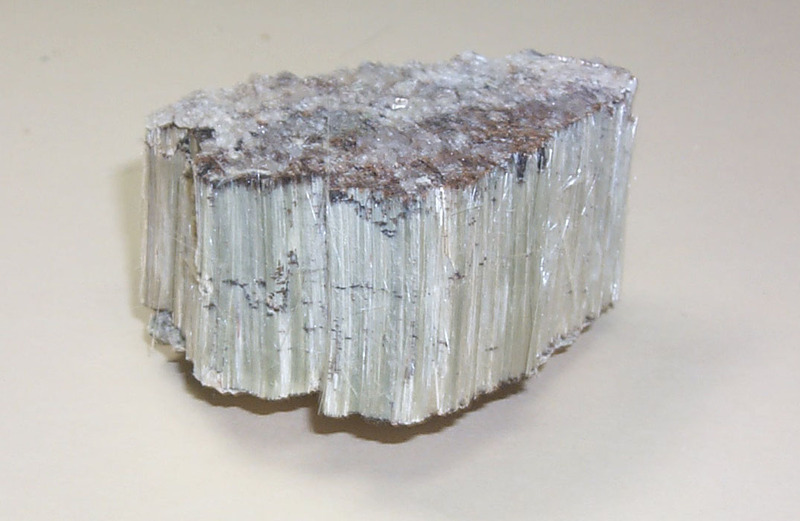 Asbestos is not one mineral but rather six characterized separate minerals. One being a serpentine (chrysotile) and the other five being amphiboles (crocidolite, grunerite (amosite), tremolite, anthophyllite and actinolite). Dissimilar to alternate minerals in the main 10 deadliest. It was once broadly utilized for an assortment of business and mechanical applications on account of its solid, fireproof, and adaptable nature from roof tiles and roofing materials to ground surface and warm protection. Torbernite is the mineral from hell fire. 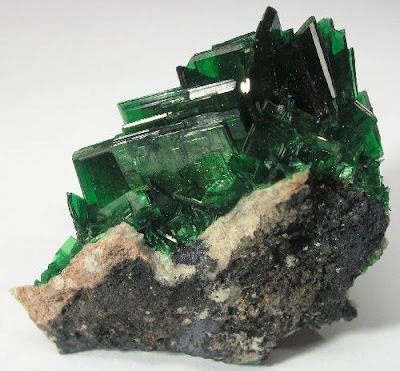 The crystal moulded green gems structure as auxiliary stores in granitic shakes, and are made out of uranium. Framed through a mind boggling response between phosphorous, copper, water and uranium, the shocking gem showcases have allured numerous mineral authorities into taking an example for a rack accumulation. The mineral is radioactive and emanates the disease shaping radon gas. This is one mineral you don't need on your showcase bureau rack. Erionite (NaK2MgCa1.5)[Al8Si28]O72 28H2O) is an actually happening stringy mineral that fits in with a gathering of minerals called zeolites. It for the most part is found in volcanic fiery remains that has been modified by weathering and ground water. It looks a considerable measure like asbestos minerals and damages people much in the same way: mesothelioma. It's essentially an industry-particular infection or if nothing else it was, until we understood that it created super-malignancy and quit mining the stuff in the late 1980. 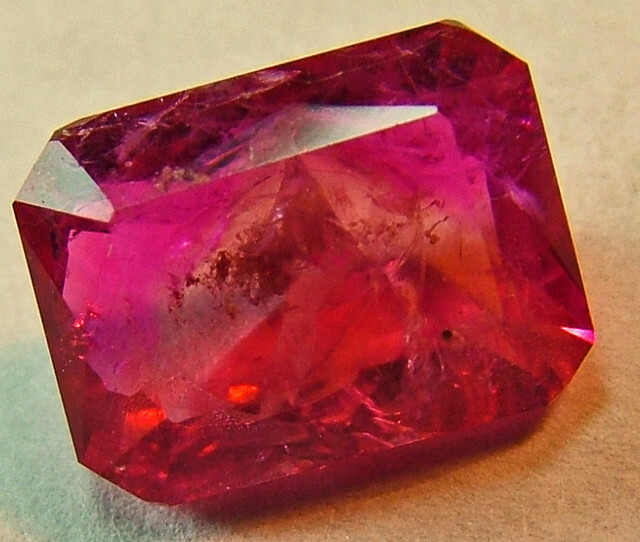 Cinnabar (mercury sulphide - HgS) is the absolute most harmful mineral to handle on earth. It is the world's fundamental wellspring of mercury and has been mined subsequent to Neolithic times. In any case, when oxidized, this component will create methyl mercury and dimethyl mercury, two dangerous intensifies that cause un-salvageable damage to the sensory systems of kids. It is dangerous in little fixations and can be consumed through the respiratory tract, entrails, or skin. Much all the more unfathomably, some antiquated medicinal experts trusted cinnabar held recuperating powers, and recommended it for specific conditions. 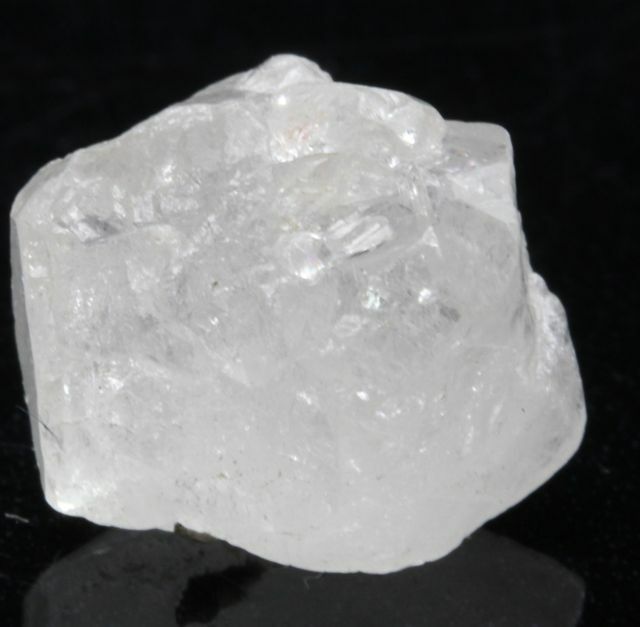 Phenacite is a genuinely uncommon nesosilicate mineral comprising of beryllium orthosilicate, Be2SiO4. 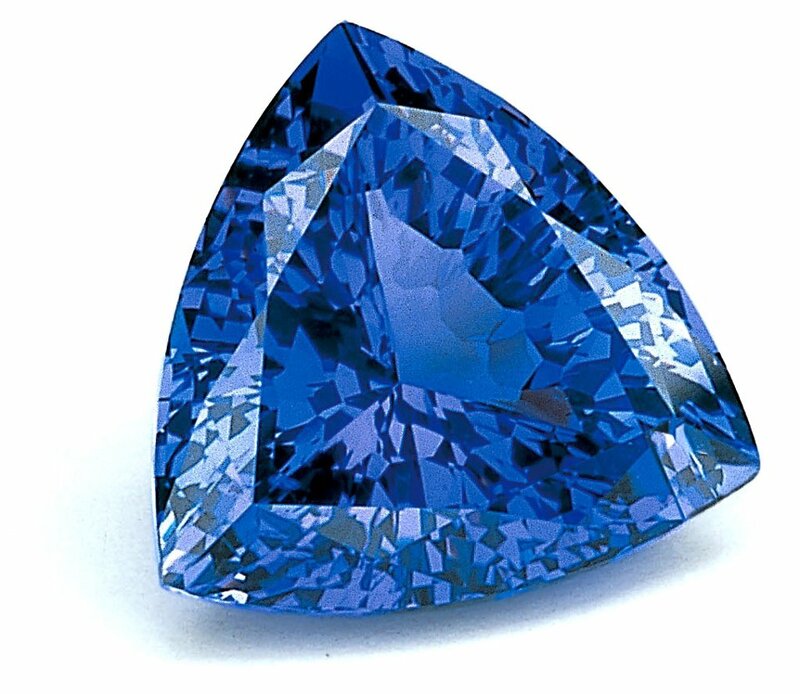 Phenacite is mined both as a gemstone and for its important beryllium content. Beryllium was at one time a forerunner for some fired materials, until individuals made sense of that breathing in Beryllium dust brought about berylliosis otherwise known as interminable beryllium sickness. It's similar to silicosis however a great deal more extreme furthermore unending. You don't recoup from CBD essentially by minimizing your beryllium presentation. When you have it, you have it forever. Fundamentally what happens is the lungs get to be easily affected to berrylium, which causes an unfavourably susceptible response wherein the lungs from little knobs called granulomas. These granulomas make breathing amazingly troublesome and can go ahead to affect illnesses like tuberculosis. 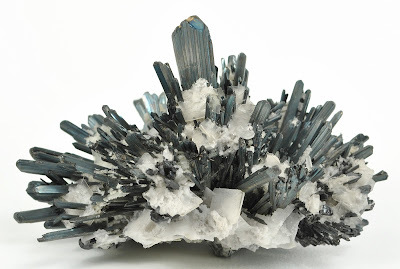 Stibnite is a sulphide mineral with the equation Sb2S3. Hence, the tremendous, sparkling metallic gems of this shaky compound were once designed into superb eating utensils. Be that as it may, the sword moulded precious stones bore the forces of death to the individuals who utilized them. Treatment of this metalloid mineral can bring about harming. Hydroxyapatite (Ca5(PO4)3(OH)2 is a normally happening mineral type of calcium apatite. The phosphorous in your greenery enclosure manure and fluoride in your faucet water likely originated from a stone like this, called Apatite. These phosphate minerals come in three mixed bags, each separately containing hoisted levels of OH, F, or Cl particles the Hydroxyapatite variant being a noteworthy segment of your tooth finish and the Fluorapatite form constituting what's dumped into metro water supplies to avert depressions. Keeping in mind having solid teeth and bones is something worth mining so as to be thankful for, presentation to Hydroxyapatite (either or handling it) will store those same minerals on your heart valves, viably petrifying them. 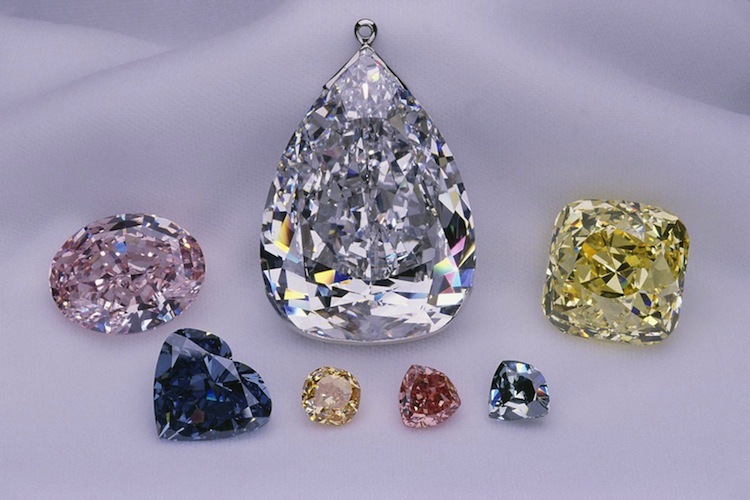 Rarest and most expensive gemstones on the Earth ranges from few hundreds to millions worth. All through history, people have embellished themselves with gems. First produced using bits of shell, bone and sparkly shakes, and later, with pearls set in copper, silver and gold. It takes a large number of years for gems to shape in nature, and just a small amount of those will ever be discovered, mined, cut and sold as gemstones. The estimation of gemstones relies on upon numerous components, including irregularity, quality, setting, and even legislative issues. Dive into the universe of unbelievably lavish gems with our summary of ten of the world's rarest and most important gemstones. Discovered just in the foothills of Mount Kilimanjaro, in Northern Tanzania, this blue-purple stone is another very prized shading moving jewel. 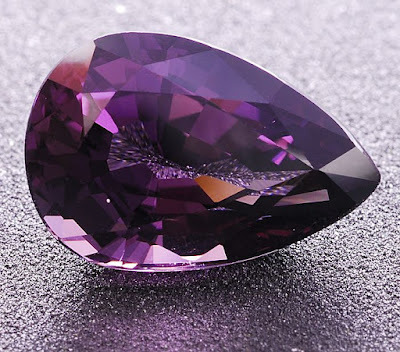 Because of the restricted accessibility, Tanzanite may be mined out inside of 20-30 years. It will surely turn out to be significantly more desirable...and profitable. Arrangement: Calcium, Aluminum, Silicon, Hydrogen, Oxygen. The Market Value: $600-$1,000 per carat. Taaffeite (maintained "tar-fite") is named for Australian gemologist Richard Taaffe, who found a cut and cleaned example of the stone in 1945. Just a modest bunch of these valuable stones have ever been discovered, making them a genuine authority's diamond. 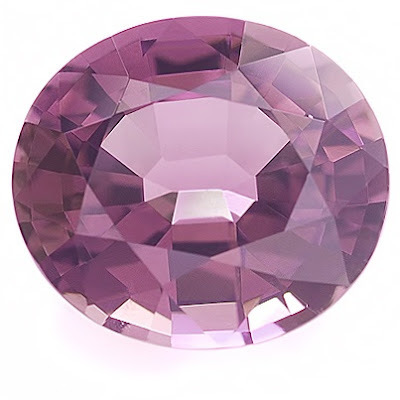 Found in scope of tints going from almost dreary to lavender, mauve and violet, Taaffeite happens in Sri Lanka and Tanzania. Different sources may be found, yet until then, Taaffeite stays one of the rarest and most profitable jewels on the planet. Organization: Magnesium, Beryllium, Aluminum, Oxygen. The Market Value: $1500-$2500 per carat. The rarest sort of Opal, the national gemstone of Australia, Black Opal is additionally the most important pearl of its kind. 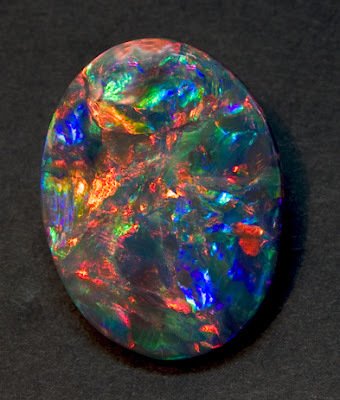 All accessible Black Opal originates from the Lightning Ridge mine in New South Wales. The splendid play of shading, or "flame," in these dim diamonds, alongside their relative shortage, causes them to be worth over $2300 per carat. Organization: Silicon, Hydrogen, Oxygen. The Market Value: $2,355 per carat. 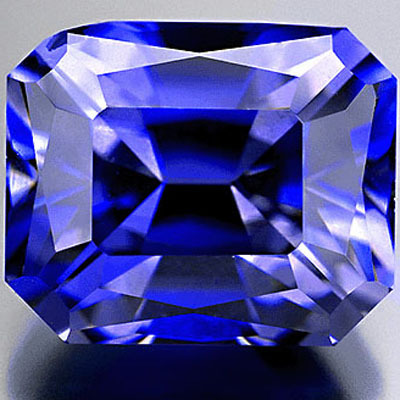 Found close to the San Benito River in California, Benitoite is a blue to purple gemstone initially found in 1907. Under UV lights, it sparkles a splendid pasty blue. A couple of examples have been found in Arkansas and Japan, yet the main business mine is in San Benito County, California. Not with standing being the official state pearl of California, Benitoite is a desired authorities' diamond, and is additionally sold in gems, however once in a while accessible in sizes of one carat or more. Piece: Barium, Titanium, Silicon, Oxygen. The Market Value: $3000-$4000 per carat. 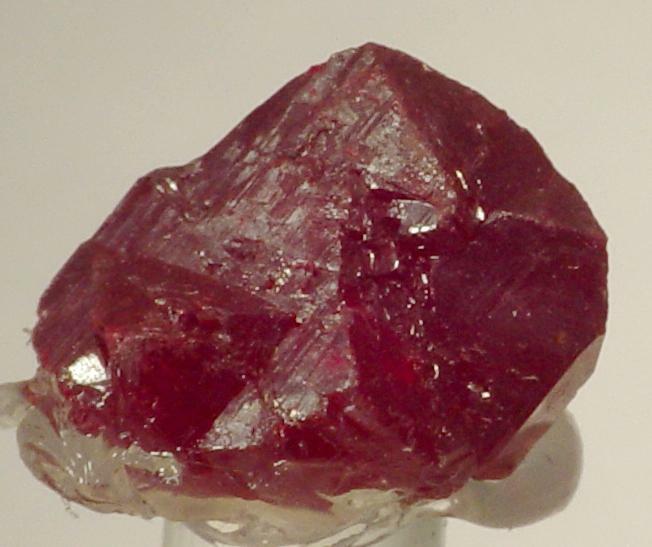 Likewise called Scarlet Emerald or bixbite, Red Beryl has just been found in Utah and New Mexico and the main business mine is found in the Wah Mountains of Utah. Red Beryl has been depicted as 1,000 times more important than gold: cut stones frequently offer for more than $2,000 per carat - and as much as $10,000 per carat. Piece: Beryllium, Aluminum, Silicon, Oxygen. The Market Value: $10,000 per carat. Named for Tsar Alexander II of Russia, this exceedingly uncommon gemstone was thought to be mined out after the first stores, found in 1830 in Russia's Ural Mountains, were almost depleted. 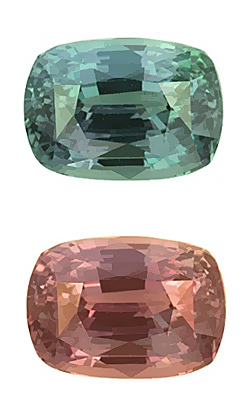 Alexandrite is a shading evolving gemstone: its tint shifts from red to green contingent upon the light it's presented to. Late finds in Brazil, East Africa and Sri Lanka have brought this stone back available, however it is still one of the world's most pined for stones. Organization: Beryllium, Aluminum, Oxygen. The Market Value: $12,000 per carat. Jadeite may sound like the different semi-valuable stones referred to casually as "jade," however this unimaginably uncommon diamond is ordinarily more significant. Prized most when it is hued a profound, translucent green, Jadeite is for the most part found in restricted amounts in Myanmar. In 1997, Christie's closeout house sold a Jadeite jewelry for about $10 million. The most elevated quality "Majestic" Jadeite can offer for a great many dollars for every carat when cut and cleaned. 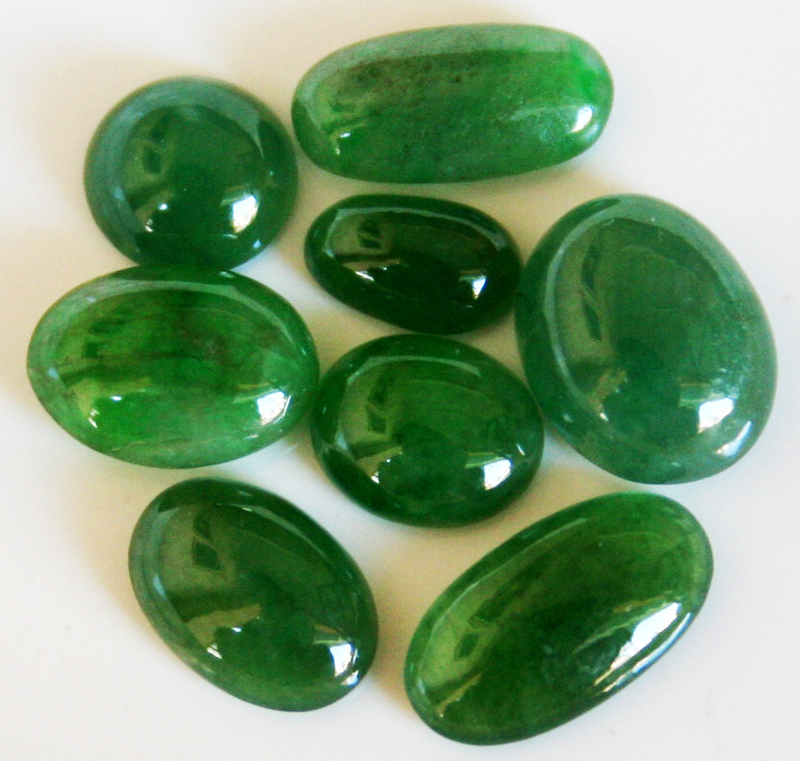 Tragically, numerous brokers have gone rotten regarded stones as genuine Jadeite. Creation: Sodium, Aluminum, Iron, Silicon, Oxygen. The Market Value: $20,000 per carat. Another valuable stone in the same family as Taaffeite, this present stone's shading extents from a splendid greenish dim to purple. Musgravite was found in 1967 in the Musgrave Range of Southern Australia, and for a long time there were just eight known examples. As of late, little amounts of Musgravite have been situated in Greenland, Antarctica, Sri Lanka, Madagascar and Tanzania. Try not to let this new "overflow" trick you, however: this extraordinarily hard stone is still exceedingly uncommon, bringing $35,000 - or more - per carat. Organization: Magnesium, Beryllium, Aluminum, Zinc, Iron, Oxygen. The Market Value: $35,000 per carat. In the 1950s, minerologist Arthur C.D. Paine experienced an uncommon caramel stone in Myanmar (Burma) that ended up being one of the planet's rarest pearls. For a considerable length of time, just two slice examples were known not, bringing on the gem to be pretty much "extremely valuable." As of late, a couple of more precious stones have been found. 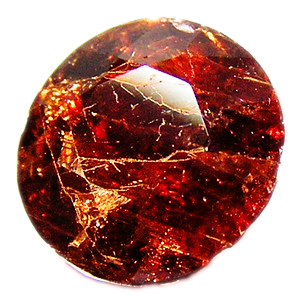 In case you're sufficiently fortunate to discover one available, hope to pay $50,000 to $60,000 per carat for this orange-to red-chestnut jewel. 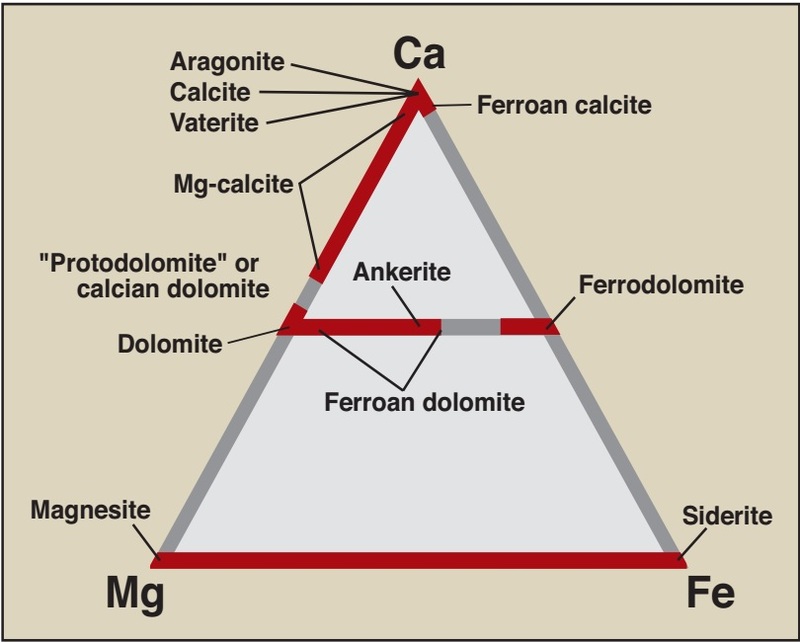 Arrangement: Calcium, Zirconium, Boron, Aluminum, Oxygen. The Market Value: $50,000-$60,000 per carat. Suppose you have an additional $80 million or something like that smoldering an opening in your pocket. What might you spend it on? Would a solitary - in fact excellent - jewel ever get your attention?. 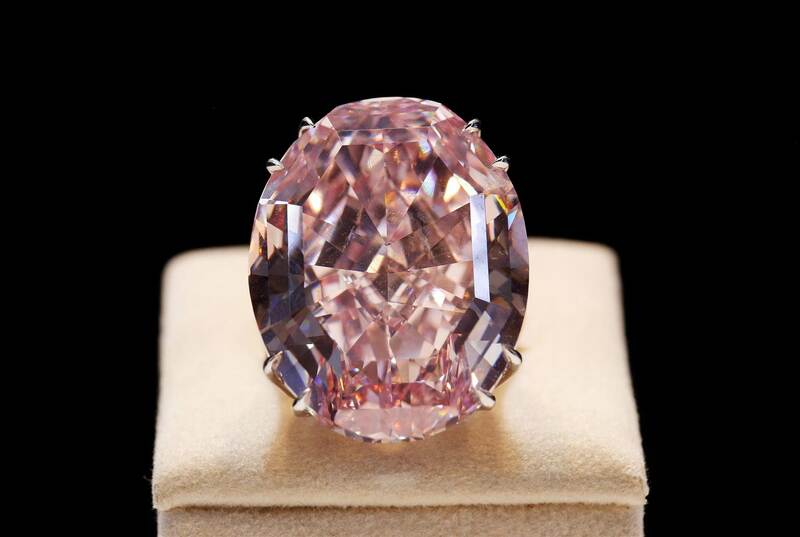 The Pink Star Diamond is an "Extravagant Vivid Pink" precious stone that was mined in 1999 in South Africa. Tipping the scales at 59.6 carats, this jewel was sold by Sotheby's for a record $83 million: more than whatever other precious stone or any pearl - ever sold.